Want something a bit more than straight tea? Try my Instant Pot Raspberry Iced Tea. Smooth and bold tea that is infused with raspberry. 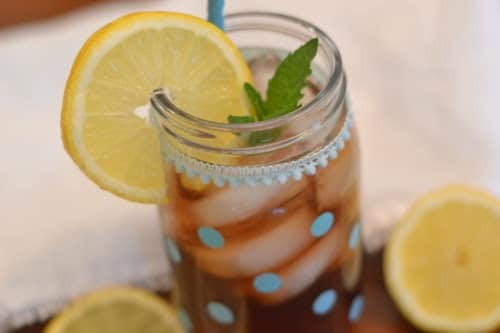 This is the perfect sweetened tea to serve at your cookouts this summer! Add in some fresh raspberries, and it is a colorful and refreshing drink to sip on this summer. You all know I love my tea! While Instant Pot Sweet Tea is a winner for me, sometimes I crave a bit more. Raspberry Iced Tea in the Instant Pot is such a breeze to make. It infuses that raspberry flavor into the tea, so you have one sweet and flavorful tea. I have a classic Raspberry Iced Tea that I make on the stove. After I have tried Instant Pot tea, I knew I had to try my hand at Raspberry! I have to say the Instant Pot did a stupendous job at getting that raspberry flavor to blend with the tea nicely. If you are a tea fanatic, you will jump for joy over this recipe. What is raspberry iced tea made of? You use tea, water, and raspberries. As the tea steeps in the Instant Pot, the raspberries are breaking down and releasing the sweetness into the tea. As you sip away, you have the flavors of a bold tea with refreshing raspberry flavor in every swallow. Feel free to use your favorite tea bags. Just make sure it is an iced tea, tea bag. I wouldn’t reach flavored tea since you are flavoring it with raspberry. You can always try to make other flavors of tea bags in the Instant Pot. Pour your tea into a pitcher and toss in the fridge. Store in the fridge for 4-5 days, and enjoy it when you want. Feel free to slice some lemons and pair with the tea, or even lime! Here is the thing about Instant Pot tea; you can adjust the sweetness to fit your tastebuds. If you find this is too sweet, reduce the sugar. Or if it isn’t sweet enough, then add more. Tea is something that is all about preference so make sure to play with the recipe to get it to fit your exact flavor needs. Give my raspberry Instant Pot tea recipe a try today! Let me know how you like it. If my Instant Pot Sweet Tea looks good too, make sure you give it a try! Pour water into your pot. Cover the pot and turn to sealing. Set your pot to manual high pressure for 4 minutes. Do a natural release for 15 minutes. Than release remaining pressure and open lid. If you would like to make your sweet tea, Lemon Sweet Tea, add in lemon slices now while cooing and leave in tea. Pour tea into a picture and put in the fridge. Set your pot to manual high pressure for 2 minutes. Do a natural release for 15 minutes. Than release remaining pressure and open lid. Pour into your Sweet Tea. Serve over lots of ice & garnish with fresh raspberries.